The patented Active Cam Technology™ is hidden deep within a solid Molybdenum cam which is 20% stronger than steel, and delivers ultimate resistance against a Lock Snapping and snap/twist manipulation. 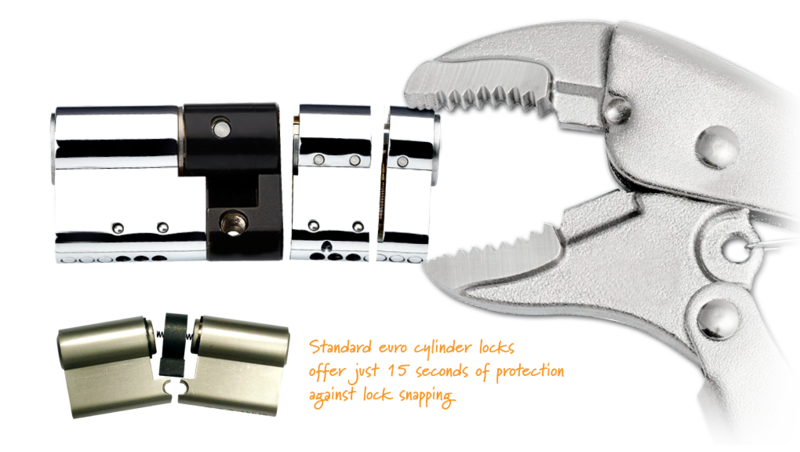 All of the snap technology is focused on the outside part of the lock only. This makes sure that maximum strength is given to the inner part of the lock - the part that has the job of securing your door. 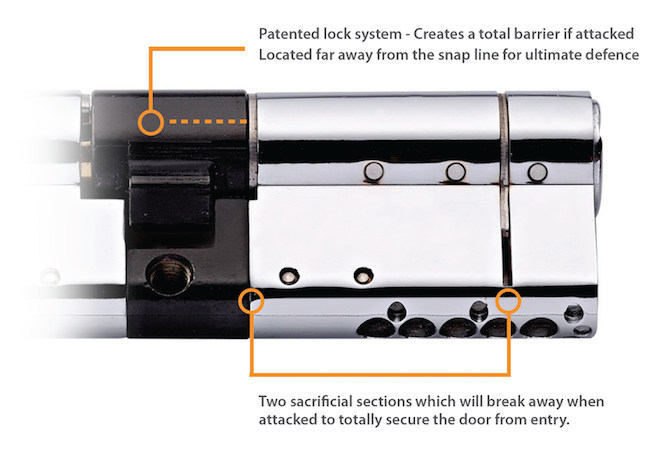 The external (outside) part of an ABS® lock has two sections that will break away if an intruder attempts to attack the lock. If the first section is removed your ABS® key can still be inserted into the lock to safely open the door. If the second sacrificial section is removed the ABS Active Cam Technology will fire into action to lock off both the cam and access into your home! This three stage approach to securing the door from the outside ensures that an intruder cannot manipulate the locking points of your door. ABS snap secure features are all placed on the outside part of the lock to make sure that the lock is not weakened on the inside when attacked. This means that key entry from inside is not compromised. So you can open and close your door safely and securely. The ABS® lock is packed full of anti-drill pins to totally secure the cylinder against drilling. Some locks have anti-drill pins only in the snap off section which are useless after the first part is snapped off! 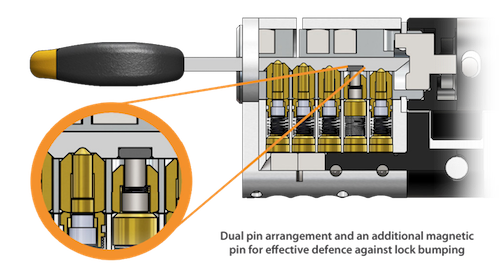 ABS anti-drill pins are located before and after the snap line for maximum defence. First of all its important to note that lock bumping and picking are skills acquired by locksmiths with years and years of experience - And in our experience are not used by the opportunistic burglar. Lock bumping is a method of entry that uses a modified key which is tapped with a rubber mallet or tool to make the pins jump to the shear line within the cylinder - the result is quick and quiet access. Lock test specifications introduced in 2010, such as TS007 and the SS312 Sold Secure Diamond standards include robust security tests to ensure that locks are secure against lock snapping. Before 2010 locks were not subjected to lock snapping tests. So although your door lock may have a kitemark, there's a strong chance it won't have a 3 star rating, meaning it wouldn't be secure enough to pass a lock snapping test. Companies that have locks stamped with a British Kitemark are audited regularly to ensure that their the products and manufacturing procedures comply with the strict requirements of the British Standards Institute (BSI). You can also link the key code to the door you have the locks installed. This means you'll always be able to get your keys cut in the future knowing that you are ordering the right set of keys. We use the secure data services of the Home Office and Police approved International Security Register with a 24/7, 365 day a year service. If you want extra keys simply contact us and we'll get your keys to you in no time.